Accept Your Quest. Collect The Fallen. Win an XBOX360 or PS3! El Shaddai: Ascension of Metatron will allow you to lose yourself in an epic tale based on the ancient apocryphal tome, The Book of Enoch. Thanks to UTV Ignition, members of The Escapist community can begin this experience right now and play for a chance to win a console of their choice, a copy of the game, and other awesome swag! How? 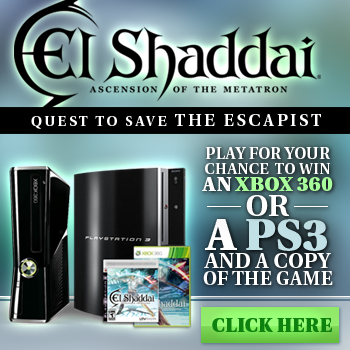 You must find The Fallen amongst your own in an epic 7-day quest right here on The Escapist. Will you accept this tale as your own? To find out how participate in the event, enter the contest, and collect 7 new badges, head over to the contest page by clicking here.